One of the classic summer drinks that we tend to go for is Iced Tea. Simple, easy, delicious and refreshing, it’s amazing how it just seems to hit the spot. One of the problems though that I seem to find though when I brew it is that it sometimes takes on a bitter taste from the tea itself. I found a tip online years ago that alleviates this problem. Simply add a pinch of baking soda to the hot water when brewing the tea. It magically counterbalances this acidity/bitterness from the tannins in the tea, and leaves you with a smooth taste. The collection of teas below are all of a sweet variety, but you can leave out the sugar in any of them if you prefer unsweetened tea. Another tip, if you plan on keeping tea in the fridge for several days, don’t leave citrus (lemons, limes, etc.) in it with the rind/peel on. The natural oils in the peel of the fruit will leech into the tea and give a bitter taste. It is best to add fresh citrus to your glass, or to the pitcher, and then remove it before storing it for the next day. Sprinkle a pinch of baking soda into a 64-ounce, heat-proof pitcher. Pour in the boiling water and add the tea bags. Cover, and allow to steep for about 15 minutes. Remove the tea bags, and discard them. Stir in the sugar until it has dissolved. Pour in the cool water, then refrigerate until cold. Serve over ice with a wedge of lemon. Sprinkle a pinch of baking soda into a heat-proof gallon sized pitcher, then add the water and tea bags. Allow the tea to steep for about 45 minutes. Remove and discard the tea bags. Stir in the sugar and lime juice until the sugar has dissolved. Cool to room temperature and refrigerate until cold before serving. Serve over ice with slices of lime. This is a bit of different kind of ice tea, in that it’s a sweet milky tea. Trust me though, once you try it, it will quickly become a favourite! Bring water to a boil in a kettle and pour over tea bags in a heat-proof pitcher. Steep the tea for about 5 minutes and then remove the bags from the pitcher. Stir in the sugar in until it has dissolved. Cool the tea to room temperature. To serve, fill a glass with ice, then pour in the cool tea until almost full. Then add 1 tablespoon condensed milk and float 1 tablespoon of half-and-half atop the iced tea. Pour the hot water into a large pitcher, and add the tea bags. Steep the tea for about 5 minutes. Remove the tea bags, and pour in the ice water and the pineapple juice. Refrigerate until thoroughly chilled, about 1 ½ hours. Pour the tea over ice, garnish with pineapple spears, and serve. * To make simple syrup heat ½ cup of water with ½ cup sugar over low-medium heat until the sugar has completely dissolved. This fruity tea is a nice twist on traditional ice tea. If you don’t have peaches or clementine, you can use a nectarine or mandarin. In a large heat-proof pitcher, and the sliced peach, clementine and sugar. Muddle the fruit and sugar to break it down. Add the baking soda, boiling water and tea bags and stir. Refrigerate the tea until cool, about an hour. Using a slotted spoon, remove the fruit and tea bags. Serve over ice with a few slices of peach. Homemade Ketchup – And 5 Ways to Take It For a Spin! So how can you have a week on condiments and not touch on ketchup? It is quintessential! Here in Canada we’re just nuts about the thick, slightly sweet treat, boasting the second highest per capita consumption of ketchup in the world, second only to Finland, (Finland?!). With that said, I really don’t know anyone that makes their own, when buying a bottle is just so convenient. However, that being said, how could I not offer up a recipe? Don’t worry though, for those of you who are not going to actually make their own (I count myself amongst you), I’ve added 5 bonus recipes below on ways to spice up your homemade or purchased ketchup! Enjoy! Pour the crushed tomatoes into a slow cooker. Swirl ¼ cup water in each emptied cans and pour it into the slow cooker. Add the sugar, vinegar, onion powder, garlic powder, salt, celery salt, mustard powder, black pepper, cayenne pepper, and whole clove. Whisk everything together to combine. Cook on high, uncovered, until the mixture is reduced by half and becomes very thick, about 10 to 12 hours, stirring every hour or so. Once the ketchup has reduced, you can smooth the texture of the ketchup by using an immersion blender on it for about 20 seconds (optional). Ladle the ketchup into a fine strainer and press mixture with the back of a ladle to strain out any skins and seeds. Transfer the strained ketchup to a bowl. Cool completely before tasting to adjust salt, black pepper, or cayenne pepper. In a small bowl, mix together 1 cup ketchup, the juice of 1 lime and 2 teaspoons of five-spice powder. Season with salt and pepper. Cook ¼ cup minced onion in a saucepan with 1 tablespoon margarine until soft, about 3 minutes. To the onions, add 1 teaspoon each of curry powder and paprika, and a pinch of cayenne pepper. Cook for another minute, then add 1 cup of ketchup and ½ a cup of water. Simmer the ketchup until thick, about 25 minutes. In a small bowl, mix together ¾ cup ketchup, ⅓ cup peanut butter, the juice of 1 lime, 1 tablespoon harissa or other chili paste and ¼ teaspoon each of coriander, smoked paprika, cinnamon and cayenne. In a small bowl, mix together ¾ cup ketchup, 2 tablespoons jerk seasoning, 1 tablespoon pineapple or peach preserves and 1 tablespoon lime juice. Please note, two important things before starting on these recipes. Firstly, if you have concerns regarding kosher alcohol, I suggest checking out the rather complete list published by the Chicago Rabbinical Council (cRc). The list can be found on their website, or directly by clicking here. Secondly, and no less important, please remember to drink responsibly. Know your limit, and stay within it! If you have had too much to drink, please consider staying over at your host’s house, taking a cab or public transportation. Do not drink and drive. This is a sparkling pomegranate margarita that celebrates the elevation of Mordechai from condemned man to hero of the Purim story. The pomegranate seeds will rise up on the bubbles from the sparkling water, just like Mordechai did! * Click here for tips on seeding a pomegranate. For simple syrup: combine equal parts sugar and water, bring to a boil and let sugar dissolve, then turn off heat and let cool completely. Rim the ridge of a large glass with a lime wedge and dip in salt. Fill the glass with ice. In a cocktail shaker, combine tequila, Cointreau, pomegranate juice, simple syrup and lime juice with ice, and shake for about 30 seconds. Pour over ice and top off with cold sparkling water and a few extra lime slices. 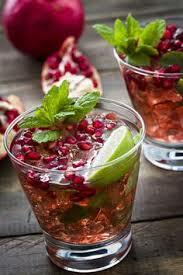 Add some pomegranate seeds for decoration. 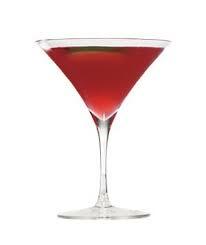 This drink takes on the dark colour of the blackberries and their tartness, just like Haman’s heart! The hint of sage, the “wise herb” adds to the vanity of Haman, who thought he was so smart! This syrup and puree will make enough for a couple of drinks. You’ll need about 6 ounces of sparkling water and 2 ounces of rum per serving. * Click here for instructions on sage and blackberries. Bring the water and sugar to a boil over high heat just until sugar dissolves. Crush the sage leaves with the back of a spoon and add to the syrup mixture and set aside to let the sage infuse for 15 minutes and then remove the herbs. Meanwhile puree the blackberries in the blender and then strain the mixture through a fine strainer. 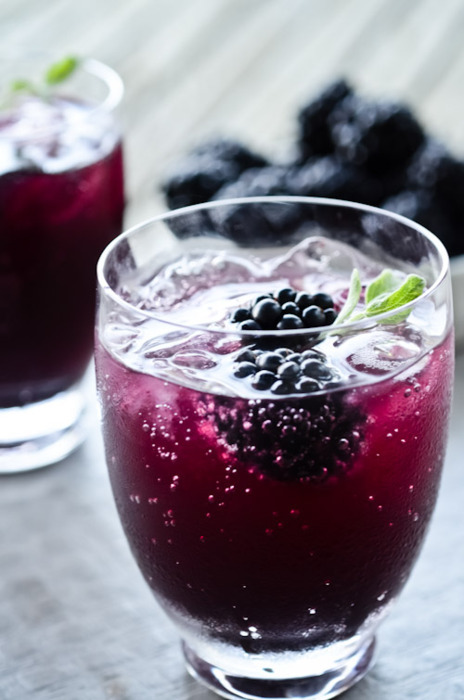 To serve place a tablespoon of the blackberry puree in the bottom of a glass, add a tablespoon of the sage syrup, 2 ounces of rum and then top off with about ounces of sparkling water. The heroine of the Purim story had many secrets… most famous though was her Jewish identity that she kept hidden until the time was right. This drink represents Esther, both in its beauty, and it’s hidden strength… it packs quite the punch! In a cocktail shaker filled with ice, add the rum, sweet vermouth and triple sec. Shake for about 30 seconds and then pour into a chilled martini glass. For those of you not familiar with jicama, you don’t know what you’re missing! Jicama, (HEE-kah-ma) also known as Mexican Yam or Mexican Turnip is the name of a native Mexican vine that has an edible tuberous root. The root’s exterior is yellow and papery, while its inside is creamy white with a crisp texture that resembles raw potato or pear. The flavor is sweet and starchy, reminiscent of some apples or raw green beans, and it is usually eaten raw. In Mexico, it is popular in salads, fresh fruit combinations, fruit bars, soups, and other cooked dishes. You can find it year-round in the produce section of many supermarkets and Latin American markets. Select firm, dry jicama roots. Skin should not appear shrivelled, bruised, or blemished. Place jicama, cabbage and carrots in a large bowl. Whisk together the lime juice, vinegar, ancho powder, honey and oil in a medium bowl and season with salt and pepper. Pour the lime mixture over the jicama mixture and toss to coat well, fold in the cilantro. Let sit at room temperature for at least 15 minutes before serving. * Click here to learn how to properly inspect a Napa Cabbage and cilantro.